Children's chapel is a time for discovering the lives of saints and how they touch our lives today. St. Martin, the soldier who became a servant of Christ, offers a way to discover how following Jesus can change your life. We thank you for your many blessings. And draw us closer to you and your will. Psalm: Psalms suggested for St. Martin of Tours include Psalms 15 and 34:15-22. These can be prayed as call and response, or the children can say a responsorial phrase extracted from the psalm text. For example, the first line could be repeated after each stanza. Martin lived in the 4th century – one thousand, 700 years ago. He was born in what is now Hungary and lived in what are now the countries of Italy and France. His father was a soldier in the Roman army, and when Martin was 15, he became a soldier as well. Most likely he was drafted into the army. Martin took care of the sick, the hungry, and the poor. He had a reputation for caring. It is even said that he would not allow his servant to wait on him. Martin had heard about Christianity and the Christian ways were already in his life. He decided to study to be baptized so he could accept the faith fully. At the time, Martin lived in Amiens, France which is in the north part of the country and where it could get very cold in winter. One winter day, Martin was riding his horse into the gate of the city of Amiens when he saw a beggar asking for help. People walked by the beggar, as if he were invisible. Martin’s heart was touched by the beggar’s request, yet had no money to give him. He did have his military cloak, and the cloak was big enough to share! So he took his soldier’s sword and cut his heavy cloak in half, giving one half to the beggar and keeping the other half for himself. Martin may have looked silly, riding home wearing only half of his uniform cloak, but he didn’t care because he knew he had done the right thing to help the poor man. Martin was baptized at 18, became a monk, and eventually a bishop. There are many more legends and stories about his work and his life. He was so beloved that there are more than 400 towns and 4,000 churches in France named after him. Sometimes, the church preserves items owned by a saint. These are called “relics”. The building where people went to visit the relic of St. Martin’s cloak was known as the capella – a variation on the Latin word for cloak (cappa). That is the origin of the word “chapel”. Capella, the building where Martin's cloak was kept as a relic, is also the origin of the word “chaplain." A chaplain is a pastor who does his or her ministry outside the walls of a church building. Martin served the men and women of his world wherever he found himself. A soldier himself, St. Martin is also the patron saint of veterans – men and women who served their country in the military. We celebrate St. Martin’s day on the day he died, November 11th, which is also Veterans' Day. We take time on November 11th is to honor and remember veterans, those who still serve in the military, and their families. It is also a time to remember what we can do to make peace and share as Martin did. Why do you think we read this Gospel lesson for St. Martin? Have you ever shared anything? What do you think Jesus means when he says, "Whatever you do for my brothers and sisters, you do for me?" What do you think it would be like to have Jesus visit you in a dream? Do you know any veterans? Do you know anyone who has a family member in the military? How do you care for them? What do you think they might think about St. Martin? Just as the beggar was invisible to hose going into the city of Amiens, are there people in your town who need someone to call attention to their hurt How can you be like St. Martin? St. Martin's Day in Europe is often celebrated with lanterns, signifying the light of holiness. Just as St. Martin brought light to those who lived in dark times, so too do the lanterns light up the dark night at the beginning of November. Alphabet Garten has some lantern suggestions, as does searching for "St Martin's lanterns" on Pinterest! Create a slide show: Download images of paintings, icons, and statues that depict St. Martin cutting his cloak and giving it to the beggar. 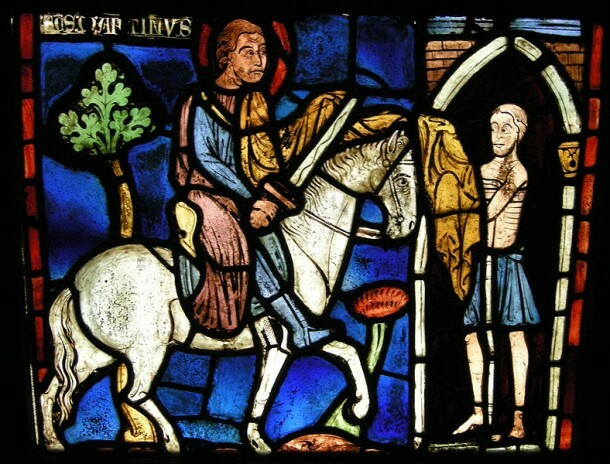 Include images of churches named after St. Martin of Tours – interiors and exteriors. Images from Ligugé Abbey (also known as St. Martin’s Abbey) in Poitiers, France, where St. Martin lived as a monk, also help tell the story. Go through the pictures in a teaching, responsive way. Then play chant and have the children watch the images devotionally, or let it play in the background as other work continues. Sing: I sing a song of the Saints of God (Lesbia Scott). The second verse includes a soldier as well as the “slain by a fierce wild beast” line which always captures the attention of the children. While this beloved hymn is charming and part of several generations of faith memories, there are many words making it difficult for younger children. Role play: What does it feel like to be the soldier-Martin? Who wants to be the beggar at the gate? How can we act as St. Martin today? Closing Song: Those who do not have a customary closing hymn, there are lyrics to a Final Blessing which can be downloaded for free by going to the Free Resources section of The Calendar Song. Blessing: Holy Father, give us grace to follow St. Martin in his holy steps, that we may share your love with those around us. Send us into your world to be a light to those around us. In the name of your blessed son, Jesus Christ. AMEN. St. Martin of Tours: Soldier, Bishop, Saint by Regine Pernoud and Michael J. Miller is a scholarly account of Martin’s life. As of this posting, no children’s picture book have been published in English. Perhaps children in your congregation could be the first to do so! Please send art and video to thecalendarsong@gmail.com for posting and sharing. A YouTube Video, enthusiastically narrated about St. Martin. The Wall, by Eve Bunting is about a young boy who visits the Vietnam Memorial in Washington D.C. to find his grandfather’s name. For ages 6-9. Every week we remember those who have died in our worship. This may be a difficult book to read in a children's chapel, but is worth recommending to families who have lost someone in a war. Brook Packard is an educator, musician, and Gaia Women's Leadership certified life coach in addition to many other creative endeavors. She is the author of When the Bishop Comes to Visit, an Activity Book for All Ages. Brook helps families make bedtime simple and put sleep first at the Sleepytime Club. Sign up for a free guided meditation with illustrated booklet that helps children "Put the Day to Bed."